A few days ago I asked my readers for help on bringing together a series on things that we can save money on by making them at home. I thought this was a great one that anyone with a child in diapers could benefit from!! 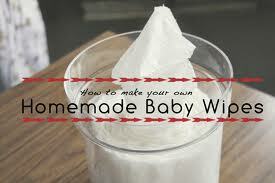 I personally use cloth wipes (most of the time) and I just keep them moist with plain water. It has worked so far but I am really excited to try one of the recipe’s below!!! For either, mix the liquids together. Put the paper towels in the container and pour the soap and water (and oil) mix over them. My blog is here to help all of us save money!! Please feel free at any time to leave comments or ideas!! I love sharing these ideas and helping others save money!! Thanks Hope for sharing this with us!!! I have done this! So easy! I have heard of this before but always wondered about it! Thanks for posting! wish I had read this earlier when I ran out of wipes and it was raining cats and dogs out and I couldn’t go to the store with a baby! LOL.. now I know a solution! This is a great idea! Thank you so much for sharing! Will be trying this for sure! I am going to try these on my niece!!! Thank you! !